The team of SR&ED tax-incentive specialists at One PBS offers you experienced consultation and assistance with Canadian Scientific Research & Experimental Development (SR&ED) tax credit programs. One PBS can help you maximize your tax refund! You Could Benefit - Don't Miss Out! Many companies are discouraged by the complexity of the legislation and the overwhelming technical and financial documentation required for a successful SR&ED filing and smooth refund process. Let our experts determine if what you are already doing in your business could be eligible and guide you through the process to help make the SR&ED program an integral component of your business strategy. Let One PBS SR&ED consultants help you optimize your tax refund. Don't miss out on the benefits of this extremely generous program. "I have had the pleasure of working with Jonathan for several years and found him to be personable, knowledgeable and professional. I personally benefited from his analytical problem-solving style. Through gaining an understanding of each client, he is able to evaluate the relevant needs and devise an approach to satisfy even the most demanding of clients. His experience with SR&ED tax credits has facilitated his clients in making these claims and realizing these refundable investment tax credits. Jonathan is efficient, possesses a strong work ethic and is passionate both about his work and pleasing his clients." "Mr. Ruben and his team are experts in the field of Scientific Research and Experimental Development claims. They have assisted with an outstanding record of 6 successful consecutive claims for our organization since its inception. The team knows exactly how to effectively guide and manage clients through this very complex and intricate system in a manner that puts clients at ease. Having the exact knowledge of what the government is looking for in submissions, they guide and assist with the detailed work and statistical analysis that is required throughout the year. 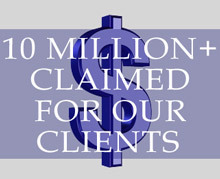 We believe that there is no better small business consultant out there to help manage all of your SR&ED claims." "Before being referred to Jonathan Ruben, our company was outsourcing our SR&ED claim preparation to a firm that specialized in SR&ED claims. Not only did this firm not know our business, it was also taking a cut out of our refund. Since Jonathan has been providing our corporate and tax planning services for the past few years, he knows and understands our business and is able to apply this knowledge when giving us advice on preparing our SR&ED claims. He takes a personal interest in your business and overall financial success. He is available whenever you need him, quick to respond to calls and emails and attends CRA SR&ED meetings in person. His guidance and expertise has provided value-added service to our growing company. I highly recommend his services for all your financial and tax-planning needs, especially SR&ED." "After starting out with another accountant and experiencing the frustration of a start-up business with a dream not being taken seriously, we met with Jonathan who quickly and astutely spotted several opportunities for growth within our company. With the help of Jonathan's team's tireless, passionate effort setting goals, keeping us on track with metrics, visual reporting and insightful advice, guiding us through the SR&ED maze yielding annual 6 figure refunds, structuring incentive plans for our team, securing financing and playing the critical CFO role to an absolute 'T', while always bringing value to the table, our revenue has grown more than 20 fold. Our management and accounting teams have enjoyed their interaction with the Orchard PBS team immensely and find their accessibility and responsiveness an absolute pleasure. We highly recommend Jonathan as a very positive addition to the key advisor group of any business looking to take their game to the next level." "Jonathan Ruben has been my CA for over 10 years providing the most exceptional client service and attention to detail. He and his organization provide an truly approach combining financial, business, research and investing guidance. Jonathan helped me set goals both personally and financially, building a successful plan that allowed me to ultimately surpass what I thought was possible. Jonathan and his team are well-versed in Research and Development tax credits. His firm has successfully guided our organization in obtaining tax credits through his ability to identify eligible SR&ED projects. Jonathan is not only an incredible CA but a strong mentor and solid business coach who brings compassion, dedication and enthusiasm to our world. Thanks JR for helping me far exceed all business and personal goals." "Our software development company relies on SR&ED claims to cover a considerable portion of our costs. For a number of years we have depended on Jonathan Ruben to help secure those funds. He proofs our technical write-ups and completely prepares the financial paperwork. He provides guidance with respect to claimable expenses and advises throughout the process. His communications are professional and timely and he consistently deliveres our claim documents within 3 weeks of our year-end date. This has allowed us to get the cash in our hands as fast as possible. Our experiences with Jonathan have been nothing but positive and we highly recommend his services."